MOSES, a faith-based advocacy organization, came together to push for the study in partnership with a dozen other local groups based on concerns over water affordability and infrastructure concerns dating back prior to the city’s bankruptcy. With the support of both Praxia Partners and Haas, this report has now been delivered to the public, to leadership, and to other cities that will be addressing their own water insecurity challenges in the future. 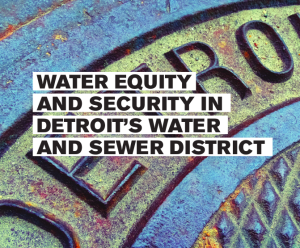 The report outlines the health, social and environmental impacts of water shutoffs in Detroit and it lists seven broad actions that should be taken to address disparities in water access and the system’s governance in Metro Detroit. You can read more about the report from the Haas Institute website, or from the Detroit News. You can also read the entire report here. Inquiries regarding the report can be sent to joe@praxia-partners.com. This entry was posted in Equity and inclusion, Finance, News, Research and tagged Detroit, Economic opportunity, Environmental stewardship, Haas Institute, Joe Recchie, social justice. Bookmark the permalink.